GLENDALE, Ariz. (AP) Walker Buehler had good command of his pitches and plenty of life on his fastball in his long-awaited Cactus League debut Tuesday night. Ever the critic, though, the Los Angeles Dodgers' right-hander still found a few flaws. "A little erratic, a little all over the place, but that's what these games are for," said Buehler, who consistently reached 97-98 mph against the Cleveland Indians. "Spring training is to get my work in. Obviously, pitching against those guys is a good litmus test for where I'm at." He was asked if his velocity is where he wants it at this point. "Close," said the 24-year-old Buehler, who finished third in 2018 NL Rookie of the Year voting. "Obviously, 45,000 in the stands helps a little bit, but we're fine." Buehler's 46-pitch appearance covered 2 2/3 innings. He allowed three hits and an earned run, striking out two without a walk. "I thought Walker was where we hoped he'd be tonight," Dodgers manager Dave Roberts said. "I thought he was amped up, rightfully so, missing up. But as far as where the ball was coming out, very pleased. So for us to get 2 2/3 and throw that pitch count up, I think it was a positive night for him and for us. The second inning, I think he settled down and was better the second and the third inning. So, a very good night." The outing checked several boxes. Buehler threw in a game setting to new catcher Russell Martin and used all his pitches, including the slider he's tinkering with and a curveball with a readjusted grip. Physically, he felt sound, with no hint of the shoulder soreness that slowed his spring training to a cautious pace last month. 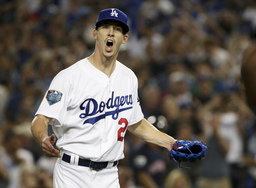 "I feel good," Buehler said. As for making his Cactus League debut within nine days of the season opener, he said: "You always want to be on time and you want to get all the innings that you need, but I'm pretty comfortable. I felt good and the ball is coming out of my hand all right, so I'll get one or two more (appearances) and be ready to go." Buehler is expected to throw again Monday in the second exhibition game of the Freeway Series against the Los Angeles Angels. With three-time Cy Young Award winner Clayton Kershaw to begin the season on the injured list, Buehler's availability is critical to the Dodgers. Although he has been ruled out as a potential opening day starter, Buehler is expected to start the year in the five-man rotation with Rich Hill, Hyun-Jin Ryu, Kenta Maeda and Ross Stripling. Last year, Buehler was 8-5 with a 2.62 ERA in 24 games, including 23 starts. He struck out 151 batters and walked only 37 in 137 1/3 innings. Hitters managed just a .193 batting average against the deceptively powerful 6-foot-2, 185-pounder. "Walker is a great blend of confidence and humility, and obviously he has the skill set," Roberts said. "He's very mature, and I think to have that maturity with the youthfulness, there may be a little bit of naivete, where he is open to anything and not afraid because he trusts his ability. Certain guys don't tinker during the season, whereas Walker is open to it. He is a unique ballplayer and athlete." The former Vanderbilt star, selected 24th overall by the Dodgers in the first round of the 2015 draft, hopes to make improvements in several areas during his second major league season. "I want to throw more strikes, get ahead in more counts and learn to throw more breaking balls," he said. "That is the big thing for me."